"Brian had a nervous collapse. What broke his heart was Sgt. Pepper." When the transition occurs between The Beatles’ "Sgt. 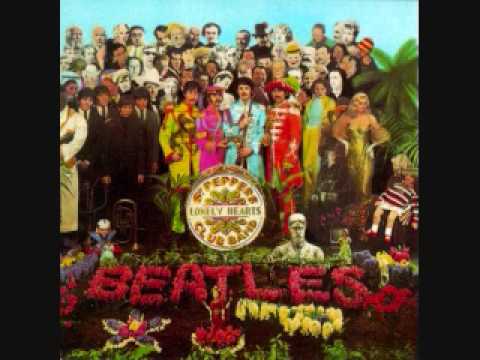 Pepper’s Lonely Hearts Club Band" (the reprise song) and "A Day In The Life," we are totally unprepared, the shift so unpredictable, so abrupt yet so smooth, even now it surprises, disrupts and flummoxes the senses. The two songs together may well represent the highest tide in popular music in the last 100 years, rivaled only by Gershwin’s "Rhapsody In Blue." By its conclusion, the Beatles had taken listeners on a diamond-dripping, psychedelic trek until it lurches into the standard rocker as the album comes to its conceptual crescendo. George Harrison was at his best in the reprise with a funk groove unusual for him, one for which the drumming set the tone and tempo. The quiet, folky guitar that introduces "A Day In The Life" alerts us that something important is about to be said, a cue that held great potency in 1967, a time when Folk music was still an influential force in music. Listen up, the strumming said. Thereafter two songs unfold played as one. The more “serious” parts are composed and sung by Lennon; the daily routine narrative sung and composed by McCartney. The theme, actually a dissonance, is eternal: news of the day – some grim, some pedestrian – is presented against the backdrop of an Everyman’s preparation for, and commutation to, work (actually it's based on McCartney recalling going off to secondary school). The mix of the tragic, the simplistic and the daily cycle give the song its lyrical punch and poignancy. It is constructed in such a way that reflects everyone’s experience – half awake, half dreaming, assaulted by media, imposed on by an acquaintance’s car accident, bored to tears about a news story about potholes. And who hasn’t woke up, got out of bed and dragged a comb across their head, forced out into a slightly surreal, generously tedious world? Interestingly, the signature alarm clock going off was initially put in to cue the band to re-enter the song on a certain beat. The track, however, was recorded in such a way that the alarm clock couldn’t be edited out, so stay it did, adding a bit of fitting novelty to the daily routine of the character waking up to face his day. The legendary marijuana references are easy to spot; the work was initially banned by BBC radio as it was in a handful of authoritarian east Asian countries. Almost a half-century on, the pair of songs is still startlingly avant-garde. The word may be overused, but "masterpiece" springs to mind. All in less than 7 minutes. Get all your Beatles merch here – albums, shirts, phone cases, DVDs. During the recording of the orchestral parts of “A Day In The Life” a handful of other Rock celebrities were on hand, including Mick Jagger, Keith Richards, Brian Jones, Donovan and Mike Nesmith. The 40-piece orchestra’s parts were overdubbed four times.